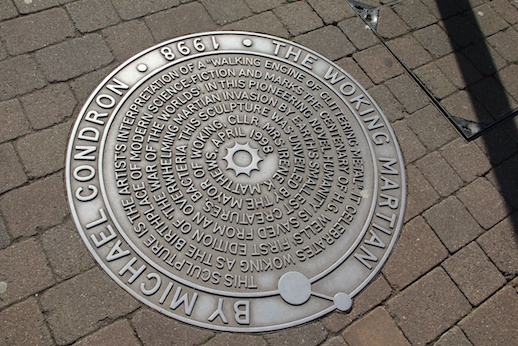 After my post about the book The Martians Are Coming, and with nothing to do the next afternoon, I jumped on a local train and visited the home town of H G Wells, a place called Woking, Surrey, England. I endeavour where ever possible, not to take what I am told, given, or learn at face value, unlike the listeners of that radio play by Orson Welles broadcast in 1938 in the USA, which resulted in mass panic, where people thought Martians were invading Earth. I need to dig down, chunk down, to discover more facts, to understand the truth behind what I am being told, what I read, or what I am being fed. And so it was, after a short journey I left the railway station in Woking. 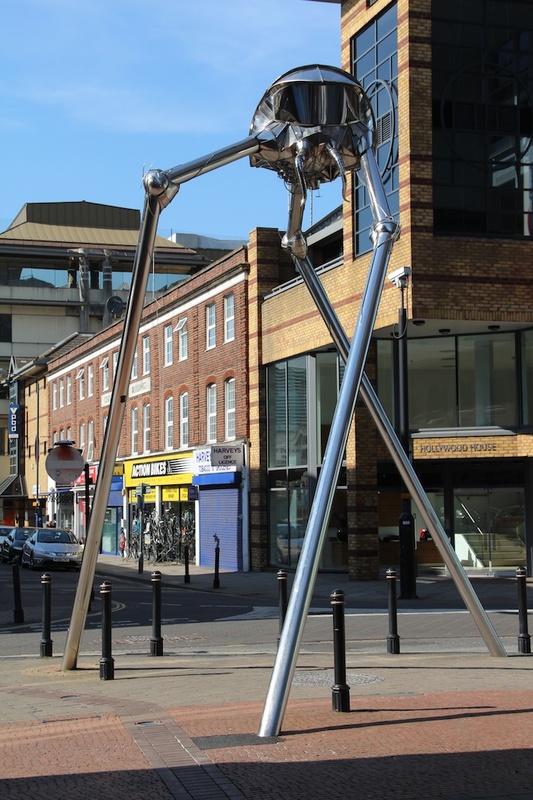 I had read that there was a Martian Fighting Machine described by H G Wells in his book The War Of The Worlds erected in the town center. I walked down a road deserted of shoppers and with not very inspiring shops, having really no idea of which direction to take, only presupposing that any artwork would perhaps be in the town center. As I rounded a corner my eyes caught sight of a jet fighter mounted on a large metal pole. Why was it mounted in the center of Woking I could not find out from asking local people, only that once it had been a indoor showpiece of the nearby Big Apple family entertainment centre. One window cleaner I talked to, said he had worked and lived in the area for fifteen years and had no idea what it was all about. I have later found out that it is thought to be the very last Hawker Hunter ever built. Then down the road from the corner of my eye, (thank you Phillip’s Sausage), I saw the Martian Fighting Machine. With very little information about the sculpture I took my time viewing this work by Michael Condron. Smaller than I imagined, some 7m (23′) tall, the sculpture seemed to be in the wrong place to honour one of Woking’s greatest authors. A quick tour of the shops and a cup of hot chocolate and I was back on a train home, not knowing much more than when I started my afternoon trip. 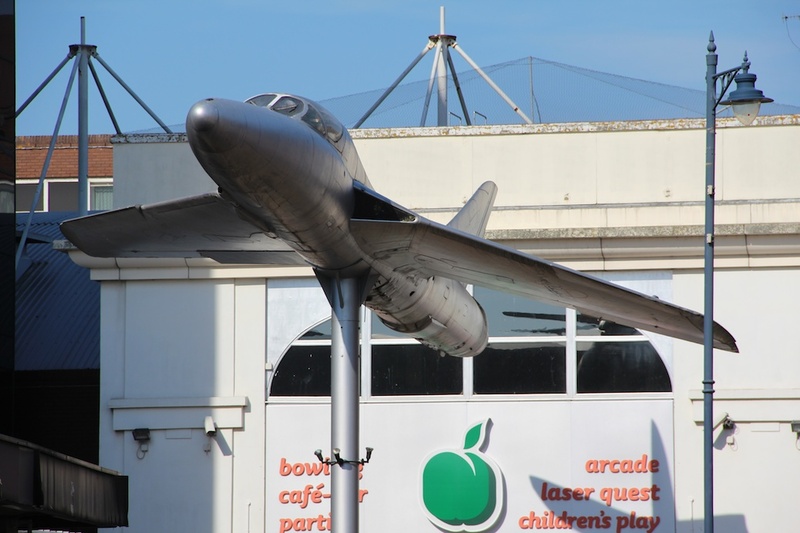 But now a little seed has been planted to research why the Hawker Hunter has been placed outside a rather seedy looking Big Apple family entertainment centre. As people who have attended my training courses around the world know, I have one love, and that is the H G Wells story of The War of the Worlds. Along with story Jeff Wayne long ago created the musical The War of the Worlds, and I can loose myself in masterpiece of music and song wrapped around a fantastic story. Set in the UK in the late 19th Century, in the area I live in Surrey, H G Wells tells the story of how earth is invaded by Martians. H G Wells weaves his story around his intimate knowledge of the area of Woking and Horsell Common, Leatherhead, Shepperton, Walton, Sheen, and so on. I get lost in Jeff Wayne‘s two CD musical, with the striking voice of Richard Burton as the voice of the journalist telling the story, mixed in with dramatic song and music. Durring my many years of listening and reading The War of the Worlds, I had also heard how late one Sunday evening in 1938, mass hysteria swept across America, as a play was acted-out on the then new medium of radio. People fled their homes, telephone switchboards were engulfed with panicked citizens demand to know what they should do to avoid the invasion. In his book, The Martians Are Coming, Alan Gallop tells the story of the actor Orson Welles had entered into the profession of acting. Orson Welles soon became well known on stage for his voice and acting abilities, for his passion for adapting plays and books into plays that he could produce and often star in. It was with a theatrical producer, John Housman, that Orson Welles set-up the Mercury Theatre, to stage plays, and this allowed Welles to pursue his acting career, which he did along side his radio work. The pair were approached by a radio company to broadcast a one hour play each week to be heard all over America. Welles would take a book and adapt it to become a radio play using the actors from the Mercury Theatre On Air group. The programmes were not a roaring success, but they were listened to. The night before Halloween in October 1938, Orson Welles had decided to broadcast The War of the Worlds, and the now in place writer, Howard Koch, struggled with taking the original work of H G Wells work set in England, and make it relevant to the ears of the American listeners. It was decided that the scene should be set in the USA, and Koch purchased a map and chose the site of the landing of the first cylinder from Mars to be Wilmuth Farm, Grover’s Mill in New Jersey. The play was based on the premise that a music program was to be interrupted by news flashes from the scene of the landing, having interviews with professors and politicians, and following the progress of the Martians in their three legged fighting machines through to New York, reeking havoc and death on their way. Although, an announcement was made at the beginning, at the end and during the play that is was fiction, many listeners tuned-in missing these messages, and those assumed that the USA was being attacked by Martians, and thus spread panic and rumours amongst the population. Not knowing what was happening outside the CBS radio broadcasting studios, Orson Welles and his fellow actors and musicians continued, reeking more havoc. This book gives the background and facts to this 1938 happening, showing how human beings can be so influenced, how we can take a little piece of information and this become the truth. How unrelated situations, in this case Hitler and the chance of Germany invading other countries in Europe can be brought in to create panic. (See Cat on the Mat). It was from here that Steven Spielberg created his film version of The War of the Worlds. NOw, I think a new film version be produced, based truly on the book of H G Wells, in the UK, using the countryside and towns written. For me the original story is far more gripping, and after all, America did not win the war against the Martians. After reading Target Tirpitz, Dam Busters, and other books on the history of World War II, (WW2), and realising how much was missing from my knowledge, my interest has been ignited to find other information, other gaps that need filling in. One area mentioned was the intelligence which was gathered about targets prior to missions, and then post mission, the information which was made available as to the success or failure of the missions. I came across Taylor Downing’s book, Spies in the Sky, which like many books being publish at this time, gathers together facts, figures, information, stories, history about what I was looking for, “the secret battle for aerial intelligence during World War II“. This well written book tells in a near chronological sequence how and why the need for intelligence started in the 19th century, through the First World War, primarily the Second World War, even through to today, from the air. It tells how Sidney Cotton, perhaps a maverick, an unconventional thinking person, used his knowledge and love of flying, to create methods of gathering aerial photographs of places of interest for military needs. It follows the story of how, despite opposition by some in power, the initial drive by Cotton was developed to a point where there were thousands of people gathering information, analysing and interpreting it to be made available just from aerial photographs, to the leaders, generals, admirals and air marshals, the planners, for battles that would follow. The book tells the stories of pilots flying often alone for long hours, deep behind enemy lines, in unarmed reconnaissance aircraft, risked their lives, many never to return or unheard of again, just to photograph the land below them as they flew above, throughout the world. Based in a country house, Danesfield House, Medmenham, in the Thames Valley near London, men and woman, civilians in uniform, academic people, gathered to process and analyse the millions of photographs taken by the reconnaissance pilots. Everyone, like those, the code breakers at Bletchley Park operated in total secret, unaware what others in other sections were doing, and their secrets were hidden from the public for many years. This book tells the story of aerial intelligence during World War II, a good read. But even more questions have been planted in my mind now. Another fantastic read, which has brought together lots of stories and knowledge I have gained, to become the realisation that many were linked together, something I had missed. OK, the subject matter that I have been reading was about the Second World War, (WW2), but what I had read and researched before, were about individual incidents/campaigns/missions, and I had seen them and understood them as that, stand-alone. Why I read the book, Target Tirpitz, was because I had just finished the book Dam Busters, the formation of the special RAF Dambusters Squadron, 617, and how they went on to finally sink the German battleship the Tirpitz. I wanted to find more information about this famous RAF Squadron. The easy to read book, left me with the feeling that it gave both sides of the story, from the point of views of the Axis Powers and the Allies, with Patrick Bishop having obtained interviews from many people from both sides involved with this part of history. The book starts with the launching of Tirpitz on Saturday, 1st April 1939 and follows the battleships life until it was finally finished on 11th November 1944. In chapter one, Alfred Zuba tells his story of the final hours of how he was trapped in the then dark capsized vessel, of how he was one of only a few who were cut out of the upturned hull, leaving nearly 1,000 men who perished inside Tirpitz when the Dambusters sealed the final blow. Although the Tirpitz really did not go into battle with Allied shipping, it did tie-up Allied Naval vessels in containing her mostly in the Norwegian Fiords, resources badly needed in other parts of the world. The book tells how the British and the Americans were being pushed by what seems very ungrateful Russians, to supply badly needed food, materials and armaments to fight the German occupation of their country. The only way to get such goods to the Russians was by the Arctic Convoys, where many men lost their lives having their ships sunk by the German forces. Winston Churchill, the British Leader, knew that the big German Naval force needed to be removed, especially the Tirpitz and the battle cruiser Scharnhorst. To do this required skill and daring, from the flyers of the British Navy‘s aircrews of the Fleet Air Arm, flying aircraft that had hardly been updated in thirty years, the submariners who tried to sink Tirpitz on two man torpedo shaped chariots as in the 1958 film The Silent Enemy, and the claustrophobic four man mini submarine the X-craft, as depicted in the 1955 film Above Us The Waves. How the Norwegian Resistance used the Shetland Bus route, a successful ferry services of agents and equipment over the cold and dangerous sea to play their role in the sinking. Partrick Bishop brings into this book other related missions to give a whole picture of the death of Tirpitz, including the St. Nazaire Raid by the British on the large Normandie dry dock with HMS Campbeltown, later made into the 1952 film, Gift Horse. So many films made about this period of history, but until now I had never linked them together, More gaps now filled in, and many more left open. A great read. It was 1967 that I was invited to the Royal Air Force base at Biggin Hill to attend the five day RAF Officer Selection, to be tested and interviewed as to my suitability to become an RAF officer. I had always had an interest in flying machines, being taken as a small boy to the now closed RAF Fradley also known as RAF Lichfield, for their open day to watch the Hurricanes, Spitfires and Lancasters doing their displays, laying in bed listening to the propeller powered aircraft flying over my parents house at fifteen minutes past midnight every night, thinking it maybe a Royal Mail flight, flying letters from London to the north of the UK. I seem to remember a Lancaster crash into a wooded area on the on the far side of the Fradley air display, but it could be my mind playing games with me. I was interested in the aircraft, knowing as many schoolboys did in those days the flying heroes, the fictional pilots like Biggles, the manufacturers and aircraft models and names, both military and civilian. This interest has stayed with me, noticing an old abandoned English Electric Lightning jet in a scrap metal yard next to the A1 road near Newark as I drove from one computer customer to another, sitting at the end of a runway at RAF Conningsby watching Lightnings and especially Phantom jets take off and feeling the power of their after-burners, driving passed RAF Waddington marvelling at the delta winged bomber Vulcans waiting on their pads to take to the skies trailing long black dirty exhaust fumes to perhaps deliver the UK’s nuclear bomb. I still visit aircraft museums, seeking new knowledge, linking ideas, marvelling at the vast array of aircraft that British industry once produced, pushing the boundaries of knowledge. 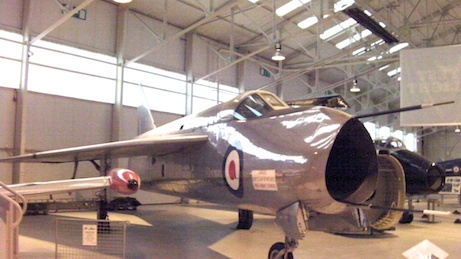 English Electric P1A Lightning prototype at RAF Cosford, note air intake later to contain the radar. But going back to 1967, and my potential to become an officer in the RAF, not as a pilot but as an Air Traffic Controller. The five day selection by the RAF, tested the knowledge of the applications, their health, their fitness, their IQ, their team working, and we were being tested from the start as soon as we entered Biggin Hill’s gate house. I was allocated along with three other applicants a “Bat Man” to look after us and who showed us to our shared bedroom, to unpack and prepare ourselves for the evening meal. My room mates rather put me in my place as one was from Eaton School, one was an Air Commodores son, and another was a Prince from a Middle Eastern country. Me? I was a son of an electrician and Secondary School educated, a country yokel. Now, I knew how to conduct myself at the dinner table, my parents had prepared me well for life, teaching me etiquette, social skills the does and don’ts, how to conduct myself in a high quality restaurant like The Ritz, how to hold a tea cup with the pointy little finger, but nothing had prepared me for so many knifes, forks and spoons at a place setting. Nothing had prepared me for so much silver wear on a table. The next day the selection process continued, for example the medical tests, writing skills, aptitude tests, and for me in the afternoon an interview with the Camp Commander, the Chaplain, and a Senior Flying Officer. Those whose turn it was to be interviewed waited in a small anti room, and one by one we were called in. Before I was called, my room mate from Eaton School went in, and I sat there wondering what was to come. My room mate came out white as a ghost, as if he had seen the end of the world, and this did not bode well for me. I asked him what was wrong, and he replied they asked him so many deep and difficult questions, including pointing to framed photographs of RAF aircraft hanging on the walls of the room, testing his knowledge of the RAF, and he said that he was asked what was the name of the missile hanging blow the wing of the fighter, and he did not know so they told him it was a Firestreak air to air heat seeking missile. It soon became my turn to face the panel, and I was called into the interview room, sitting alone in the middle of the room facing the three senior RAF officers as if I was a capture spy, and they grilled me, asking deep questions, seeking out my knowledge and interest of the RAF. Then the Chaplain pointed to a photograph hanging and asked what was the aircraft. My heart jumped because there was only one aircraft like it in the world, the English Electric Lightning, a supersonic fighter jet, designed to intercept any incoming target, especially from the Soviet Union, as it was the height of the Cold War. With its’ polished silver metal body, short swept back stubby wings, its’ two Rolls Royce Avon jet engines mounted on top of each other making up the fuselage, and its’ conical pointed radar dome mounted in the open round air intake at the front of the aircraft. There was no mistaking this aircraft, I was in my element. Then he pointed to the missile hanging from the wing, and with all the confidence in the world I answered, “It is a Firestreak Air to Air heat seeking missile“. Thank you my friend from Eaton. Today I finished reading the book by Richard Pike called the LIGHTNING BOYS, and it is a collection of stories, true tales from pilots of the English Electric Lightning aircraft, from flying virtually non stop from the UK to Singapore and the adventures along the way, to the need to constantly having to refuel midair by Victor airborne tankers. It gives insights of what the pilots did, their thoughts, their missions, and how they sometimes nearly died. 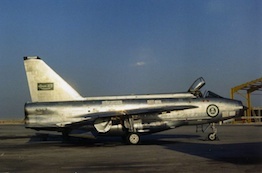 It tells the tales of those involved flying the Lightning from the first test Lightnings, the P1 and P1A (see photograph above) in 1954, to the decommissioning from the RAF in 1988. This book is highly entertaining and informative as it tells the stories of those who flew this iconic aircraft, with little or no technical details, it makes an easy read for all, the general reader and the enthusiast. In the book it tells of an RAF Lightning pilot who as a youth wanted to join the RAF, and was invited to go to Biggin Hill to the Officer Selection along with a fellow student from his school. His school friend, he said lasted a day before being sent home. I lasted two days. I packed my bags and caught the train back home, at a time when there were no mobile phones, in fact a time when most homes did not have their own phones, so I did not inform my parents of my impending early arrival from RAF Biggin Hill. On reaching home, there was no-one there, but I knew where my parents would be, at my Aunty and Uncle’s house, so I went there. Another lesson they taught me, to aim high, go for my dreams, but to know my limitations sometimes, and accept failure gracefully, and just because the RAF was not for me, that there would be other places, things and jobs that would be for me. It is always a joy to finish a course, organized by BIZ in Antalya, especially PhotoReading, when the participants have absorbed six books over the short weekend, plus had learnt so many other aspects of reading, and had given a talk on the four related books that brought in with them for ten minutes, as if they were an expert. It is amazing to listen to them talk about the four books’ subject matter with such authority, especially when they knew nothing about the subject prior to starting the weekend PhotoReading course. In one group, we had a school teacher that acted like an examiner, firing questions to each of the participants as they gave their presentations, only to be answered in a coherent way. The trouble was that when it was her turn to give a presentation, the other participants fired equally difficult questions to her, but with laughter and with good humour even her questioners were answered. I take great satisfaction in helping participants through the course, which often gives rise to self doubts as to ability, to old beliefs that there is only one way to read, and that is word by word. When the end of the course comes, often participants do not want to leave the venue, having had such an eye opening experience. But eventually they do, leaving me alone in my hotel room, to begin to relax, reflect on the course, and prepare for the next days work. I had seen trailers advertising the film of the same name, and after reading the book, I needed to watch the film. It has only now been possible to fulfill that wish. The star line-up of George Clooney, Jeff Bridges, Ewan McGregor and Kevin Spacey, obviously had great fun in making the film, and billed as a comedy, the underlining message held true to the facts of Remote Viewing, and the screen play by Peter Strughan took many of the stories (true or false) from Jon Ronson’s book, creating a very watchable film, creating a storyline that captured the essence of the book. I would still recommend reading the book. In Malcolm Gladwell’s forth book to date, What the Dog Saw, he has put together a number of essays, at taking a fresh look of why incidents or things happen. In NLP terms, to “chunk down”, to look beyond what seems to be obvious. Once again, Gladwell cites examples to back-up his writing, examples of why the birth-control bill, has a monthly cycle of taking the drug and a period of time when the drug is not taken. It makes sense when Gladwell explains that one of the inventors of the birth-control pill, John Rock was a practicing Roman Catholic, going to mass every morning, and the Vatican believes there should be no artificial methods of birth-control. Rock stated that the birth-control pill used the natural chemicals of the female body to trick it to believe it was already pregnant, and thus not release an egg, but still produce the menstrual cycle, thus the church should accept the pill. Gladwell, explains how Rock’s ideas were based upon trying to please the Roman Catholic Church, which prefers the rhythm method of abstinence, and had no bearing in the working of the birth-control pill which could be taken continuously. Research says that females are better off not having their monthly periods, being that the increase in the natural chemicals, estrogen and progestin in the females body at the time of mensuration, can cause cancer. Gladwell explains why making the tops of medicine bottles more difficult to remove in the interests of child safety, makes them more dangerous due to the complacency of the parents. He explores how we make instant decisions when meeting people, who is right for the job and who is not, and much more. In Gladwell’s 19 essays, he helps to look at things in a different way. A good read.